The NM-A90 Upgrade-Kit for NH-U12P SE2 and NH-U9B SE2 CPU coolers makes it possible to install the heatsink turned by 90° on socket AM2/AM2+/AM3/AM3+/FM1/FM2/FM2+ AMD motherboards. Using the NM-A90 kit thus gives AMD users more flexibility in aligning the cooler with the airflow inside their case. Caution: The NM-A90 Upgrade-Kit is compatible with NH-U12P SE2 and NH-U9B SE2 coolers only. 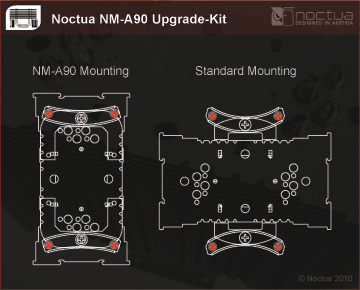 Owners of Noctua NH-U12P SE2 and NH-U9B SE2 CPU coolers can obtain the NM-A90 Upgrade-Kit free of charge via this form. A proof of purchase (photo, scan or screenshot of the invoice) of both a Noctua NH-U12P SE2 / NH-U9B SE2 CPU cooler and either a socket AM2/AM2+/AM3/AM3+/FM1/FM2/FM2+ mainboard or socket AM2/AM2+/AM3/AM3+/FM1/FM2/FM2+ CPU are required.